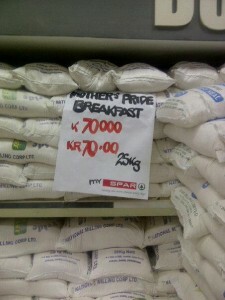 Before you start believing the propaganda in circulation regarding the reason mealie meal prices in Zambia have dropped; please read this article and many others available to you from credible sources. It has absolutely NOTHING to do with good or bad governance, but all to do with the fact that the region as a whole has been blessed with a record breaking bumper harvest. South Africa is expected to harvest the highest maize crop in 40 years. “This according to experts, might force Zambia to reduce the current selling price for maize of US$240 a tonne by about 30 percent or more because of the improved harvests in most of its neighbouring countries that earlier relied on it for food. Zambia Market Commodities Exchange (ZAMACE), among other players, warn that if this happens there could be a drop in the demand for products like maize by the neighbours, hence this will affect the selling price and further affect the small scale farmers and other players involved in the export of the commodity. CTPD acting executive director Isaac Mwaipopo predicts that the country expects the maize harvest to rise by 36 percent to 3.2 million tonnes this season from 2.4 million tonnes harvested last season. The 2017/18 marketing season could ultimately affect many of the maize traders that look to the regional markets for good value from the crop.